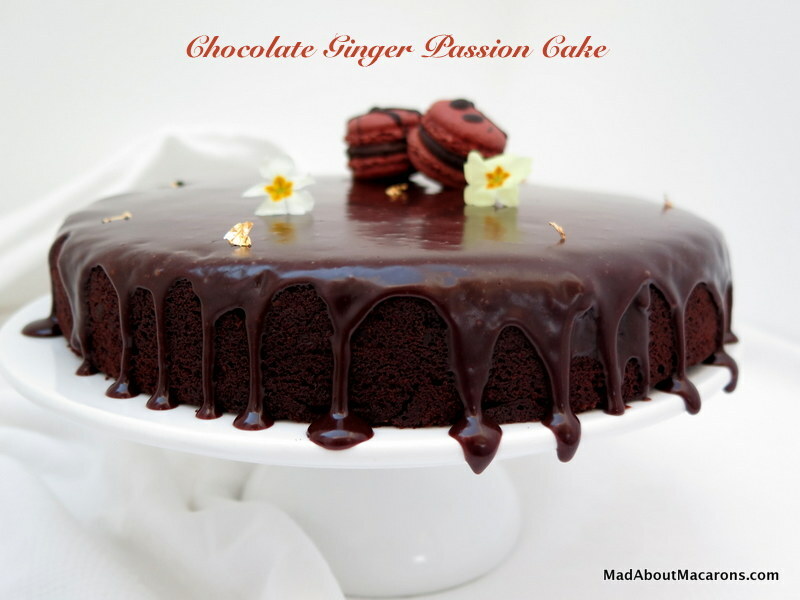 It’s high time I posted my favourite, yet easy Chocolate Ginger Passion Cake. It certainly looks “homemade” and not exactly from a posh Parisian patisserie (GASP! 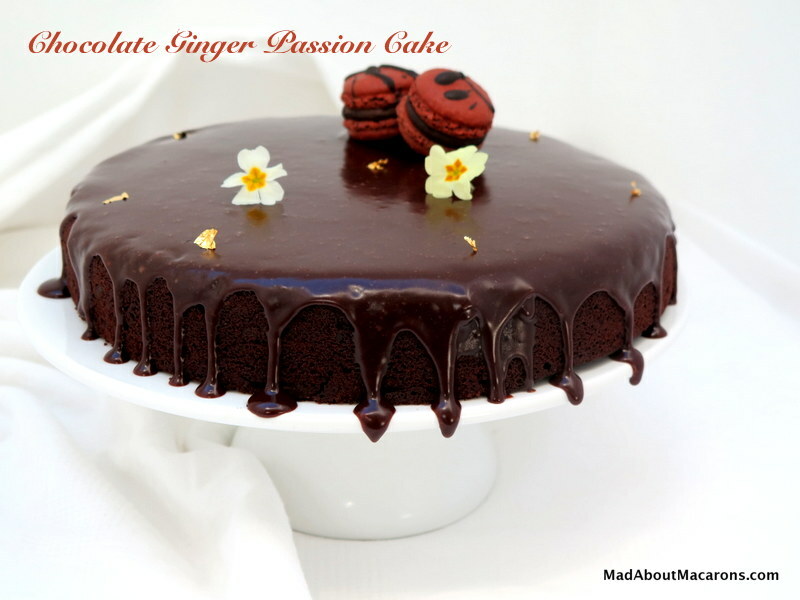 I have air bubbles in that glaze), but this cake is a family-pleaser for Easter, Mother’s Day, Birthdays, or even just to celebrate life and good chocolate! If anyone has tried my dessert recipes or teatime treats, they’re NOT OVERLY SWEET and this is no exception – especially as the lower sugar quantity brings out the flavours much more. The cake is light yet still intensely chocolate with the chips giving that extra little crunch, plus the touch of passion fruit adds a zingy acidity rekindling my first ever taste of a Mogador chocolate-passionfruit macaron extraordinaire by Pierre Hermé that has continued over the years to be one of my preferred macarons in Paris. Moreover this chocolate cake is so easy: instead of making 2 cakes or splitting one horizontally in the middle and filling it with buttercream, I just throw the whole lot in one non-stick cake pan, bake, leave to cool on a wire rack, then turn it upside down on its beautifully flat side from the pan and pour over a creamy dark chocolate glaze. Although simple to make, there’s one condition with this recipe: you must use the BEST INGREDIENTS YOU CAN FIND. I use a good quality couverture/special baking dark chocolate (Valhrona, Lindt, or Nestlé Corsé), unsweetened cocoa powder, dark chocolate chips, and strain the juice out of fresh passion fruits (without the seeds). However, if passion fruits are difficult to come by it’s just as easy to use a good quality mango or exotic fruit smoothie. 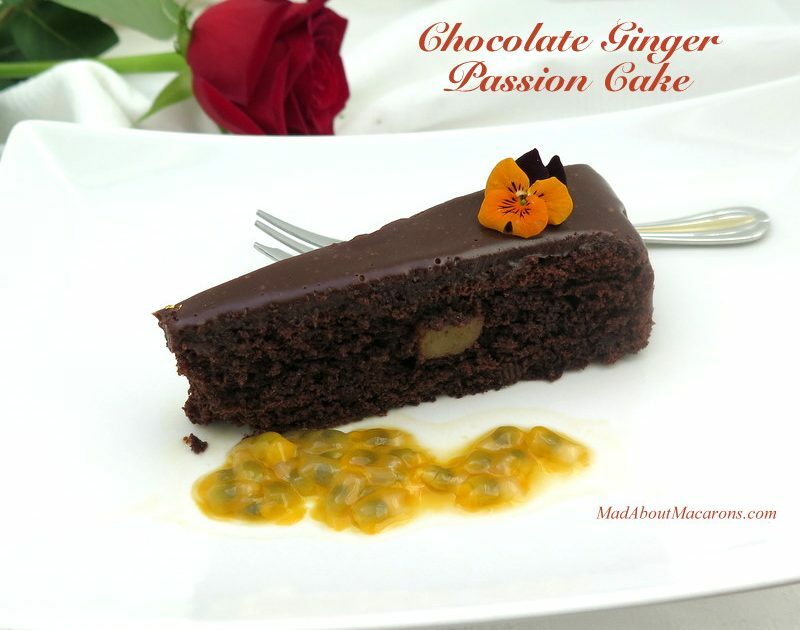 Depending on the occasion, it’s fun to DECORATE this Chocolate Ginger Passion Cake simply: what about some edible flowers, a macaron or two, or what about some chocolate mendiants (chocolate coins covered in dried fruits and nuts)? These are popular in many chocolate shops in Paris and yet they’re quick to make. 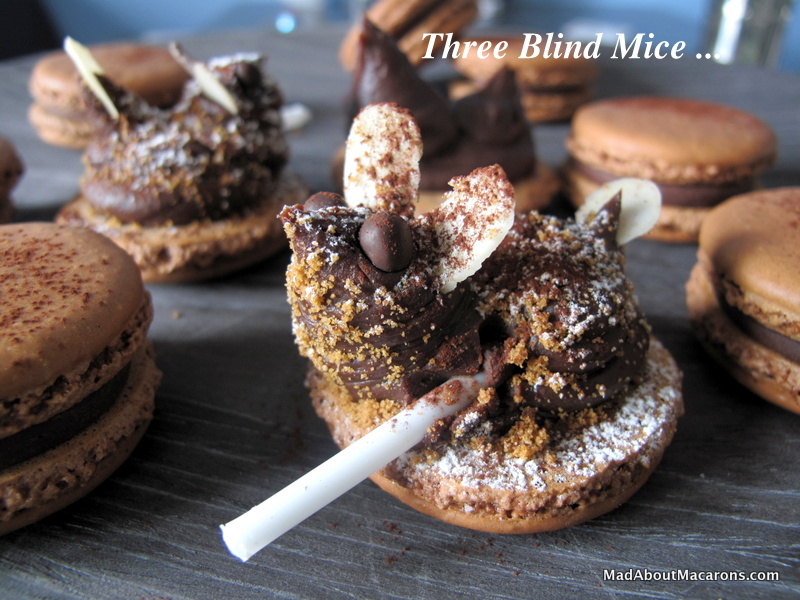 Or go crazy and make some chocolate mice macarons – see below an idea with your chocolate ganache recipe from the books! If you haven’t done so already, don’t forget to subscribe to the new email alerting service, so that you never miss a post. You can choose to be alerted either daily, weekly, or even monthly! Preheat oven to 180°C/160°C fan/360°F/Gas 4. Grease a springform cake tin or non-stick/silicone cake mould (24cm diameter). In a large bowl, sift together the flour, baking powder and cocoa powder. Cream together the butter and sugar in a food processor (or mix together in a large bowl by hand using a spatula) until light and fluffy. Add the salt then the eggs, one by one until well mixed. Meanwhile, melt the chocolate in a bowl over a saucepan of simmering water (bain-marie*), ensuring the water doesn’t touch the bottom of the bowl. As soon as it starts to melt, take off the heat, stir until completely melted and leave aside to cool slightly. Gradually add the flour mixture until well blended together, add the melted chocolate then the juice, chocolate chips and ginger until all well combined and smooth. Pour into the cake mould/tin and bake for about 30 minutes until a knife inserted in the middle comes out clean. Set aside to cool with the uneven top the right way up. When cool, you can cut off any excess hump with a good knife or cake slicer then turn the cake upside down, so that the smoothest side is facing upwards, ready to glaze. To make the glaze: Melt together the chocolate, butter and icing sugar in a bain-marie* then stir in the cream and mix together until smooth. Leave to cool about 10 minutes then pour over the cake. Delicious served with the juice and pulp from fresh passion fruits. For an Easter cake, why not decorate with these chocolate mendiants (disks) topped with nuts, fruits and mini easter eggs? This will surely please my serious chocolate eaters with afternoon coffee.. I hope you try it to confirm, Enrique. This looks amazing Jill. I love how you have shown a slice of the cake and how the chocolate is drizzled down the sides of the whole cake. The professional cakes from patisseries are often far too sweet. Definitely a contender to be made for Easter. Thanks so much, Thomasina. I hope you make it. Luckily the professional cakes from reputable Patisseries in Paris are certainly not that sweet at all – my mantra in “Teatime in Paris”! That’s why I can really enjoy the occasional pastry or two here and taste the fruit and the good chocolate – even that play of salt makes it all rather addictive… Unfortunately the chain stores, supermarkets etc. are the same in France: just TOO sweet. Another reason why it’s so good to make our own! thank you for your two books: I have bought both !!! I have a request for next future: what do you think about a parisian cake book ? You are a wonderful teacher !!! What a lovely thing to say, Salvatore. Thank you! I’m not sure I have the energy left for a third book … I’m giving everything away here on le blog! So happy you enjoy the recipes in the books. I’m loving your recipes Jill. Made this chocolate cake at the weekend and it was a great success. 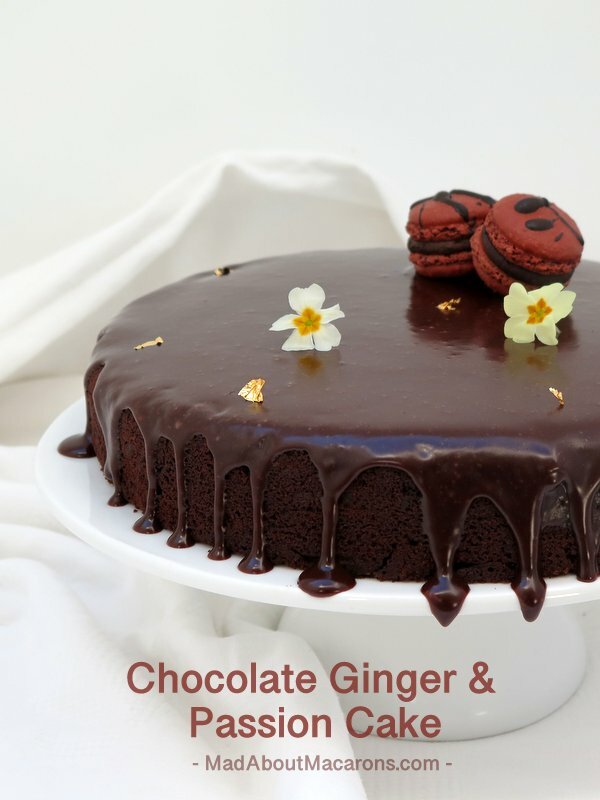 Love the texture, enough chocolate, not too rich either and the ginger in it is great. Must try your brandy snaps with mojito and scones. Also have your Teatime book by the way. Made the financiers from it recently and they’re my favorite recipe by far. Dying to try the eclairs next. Thank you! You’ve made my day Jean. So thrilled to hear you’re making the recipes here and especially from “Teatime in Paris”. The financiers are one of my favourites too: not too sweet but just enough. Have fun with the choux chapter and let me know how you get on. I could sink my teeth into a slice of this for breakfast right now! Not too sweet, you say? PERFECT! And of course, one must use top quality chocolate for a chocolate cake with chocolate glaze, or what is the point of even making it? 🙂 Looks absolutely heavenly, Jill, and I love the addition of the ginger and chips! P.S. Those mice are adorable!! thanks Christina. The passion fruit just adds that extra je ne sais quoi – and it’s healthy too! Hehe, glad you like the mice. Made these when we had a moose in the hoose so went a bit crazy.